It will be May very soon, and whenever that month comes around, it reminds me of one of my favourite Australian authors from childhood – May Gibbs. Born in England, May grew up in Western Australia, and it was while riding her pony around the bush as a little girl that she began writing stories and drawing pictures based on the native flora. After going to art school, she became a professional illustrator in the early twentieth century, and was most famed for her “gumnut babies” – plump little cherubs scantily dressed in gumnuts, gumblossom and gumleaves. She even produced postcards of the gumnut babies to support the war effort during WW I, and her house was called Nutcote. 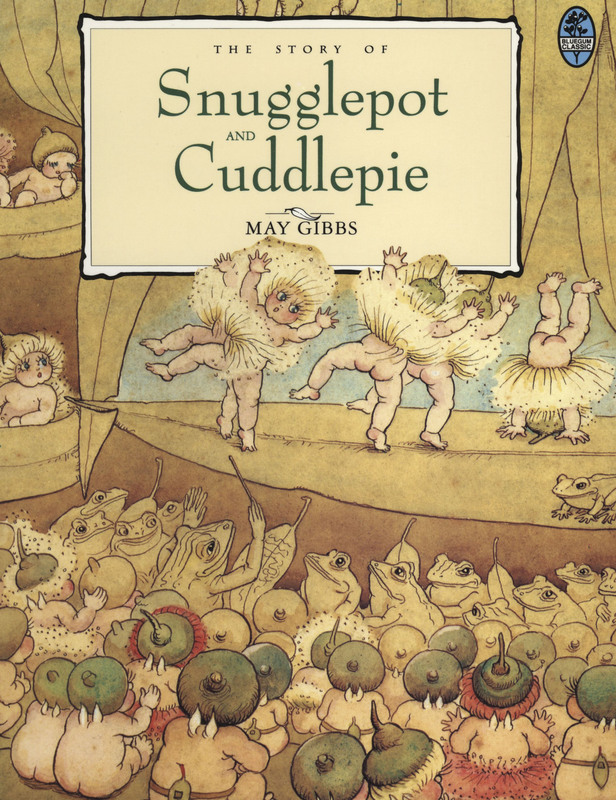 Later she wrote stories to accompany her enchanting drawings, the best-known being the Snugglepot and Cuddlepie series. Adults are charmed by the stories’ sense of fun, but for small children, they are filled with adventure and excitement, and can even be frightening, due to the villains of the story, the wicked Banksia Men. Without being sickly or sentimental, the subtle message of the stories is always that we must care for each other, and for the world around us. After growing up with May Gibbs’ picture books, it is impossible to walk through the Australian bush and not see it differently; she gave us our own fairy tales and our own mythology of nature. And because many eucalyptus trees flower in autumn (not to mention some banksia species), you can see “gumnut babies” and “banksia men” for yourself in May. The name May appears to have begun life as a short form of names such as Mary and Margaret, but very soon was associated with the fifth month of the year. The month of May is generally said to be named by the Romans in honour of the goddess Maia, whose name may mean “greater”. She probably didn’t have a connection to the Greek goddess Maia originally, but the two goddesses became gradually merged into one. Maia was a mother goddess, an earth goddess, and encouraged growth and abundance. May is in the spring in the northern hemisphere, so readily suggests the idea of fecundity. The poet Ovid said that the month was named for the ancestors, also connected to the word for “greater”; I’m not sure if this was his own idea or one in wide circulation in his day. On the first of May, the Romans sacrificed both to the goddess Maia and to the ancestor spirits who were guardians of the city. The first of May has quite a history as a day of celebration. In Ireland, it is the Celtic festival of Beltane, which marks the beginning of the summer; this is observed by Neo-Pagans around the world. Related to this is May Day, a European celebration of spring and fertility which often involves dancing around a phallic Maypole decorated in blooms, and choosing a Queen of the May, as if still honouring a spring goddess. In Catholic tradition, the month of May is sacred to the Virgin Mary and the flowering of her spirituality; a continuation of the devotion to floral mother figures. Another floral connection is the word mayflower, which can refer to several different flowering species, but traditionally is the hawthorn, also known as may, mayblossom, may tree or may thorn. The hawthorn is one of the flowers associated with Beltane, and in Ireland you can make wishes on the maytree during this festival. It is also said that they are inhabited by fairies, especially if you see a lone hawthorn bush out in the wild. To bring us back full circle, hawthorn was sacred to the goddess Maia. The name May was at its highest popularity in the 1900s, when it was #41 for the decade, and had left the Top 100 by the 1930s. It left the charts entirely between the 1960s and 1980s, but has remained in modest use since the 1990s. Currently it is #557 (11 births) in New South Wales and #489 (10 births) in Victoria. I should have said in modest use as a first name, because May gets a real workout in the middle position. You can’t read through a few pages of birth notices without seeing name combinations such as Charlotte May, Emma May, Harper May, Pippa May and Zara May – not to mention double names like Gracie-May, Ella-May and Lily-May. You might say that other names are similarly popular in the middle, such as Elizabeth, Grace and Rose – and Alice is quickly joining their ranks. However, all these names are in the Top 100 and either rising or stable, so they are clearly not being neglected as first names. Poor May lies in the doldrums, with parents preferring Maya and Mia. Even May’s big sister Mary and anagram twin Amy are much more popular, and April is far more common as a name than the following month. Yet there is something so simple and sweet about May; it sounds old-fashioned without being the least bit musty. If you would like an underused retro name which still seems fresh and youthful, why not consider rescuing May from the middle, and putting her front, rather than centre? POLL RESULT: May received an approval rating of 93% – just 1% behind the highest-rated girls name, Layla. 37% of people liked the name May, and 35% loved it. Ps on the Mae vs May- in America they have a history of movie stars being called Mae, through the 20s and 30s, which I suspect is why that spelling is more popular. I think so too – and here I tend to think Mae might be slightly more popular because of the Irish name Maeve. I have a daughter called May (nn Maisie) who is two so I was delighted to see this. She has a brother called Harry and a sister called Ava and I’m currently pregnant with our fourth and considering William to be Bill for a boy and I love Rose for a girl! I meet many people who have used May as their daughter’s middle name so I particularly love that we used it as a first name. Lovely post, thank you. Congratulations on your new bub-to-come, and William and Rose both seem very appropriate. I love the simplicity of May. I have been hearing Mae more often as a first and middle name but I prefer the straightforwardness of May. Only after I hit publish did I realise I didn’t discuss the spelling variant Mae – and then I couldn’t think of a way of quickly inserting it. But yes, I probably see at least as many Maes as Mays in the middle, although I think the couple of times I have seen it as a first name, it was always May. May seems much more first-namey than Mae to me, and more substantial. I agree with you on May vs. Mae. But in the U.S. at least, Mae is slightly more popular. Mae is at the bottom of the top 1000 and climbing rapidly (#801) and May is unranked. This floors me. I’ll have to check how both names do when the 2012 Social Security data comes out in a couple of weeks. I checked the data from Victoria, and there Mae is a bit more common than May – 13 births instead of 10. So Mae is more common here too, but just by a bit, and both names rank (in the 300s and 400s in Victoria; May is in the 500s in NSW and Mae doesn’t rank).